The Nerman Museum of Contemporary Art (NMOCA) has one of the top internationally acclaimed collections of emerging and established artists today. Public Art Review magazine named JCCC as one of the top 10 university/college campuses for public art in America, citing the sculptures, paintings, ceramics, photography and works on paper installed throughout the campus. The museum presents many of the region's most important exhibitions of leading-edge contemporary art, as well as dynamic and diverse educational programming. 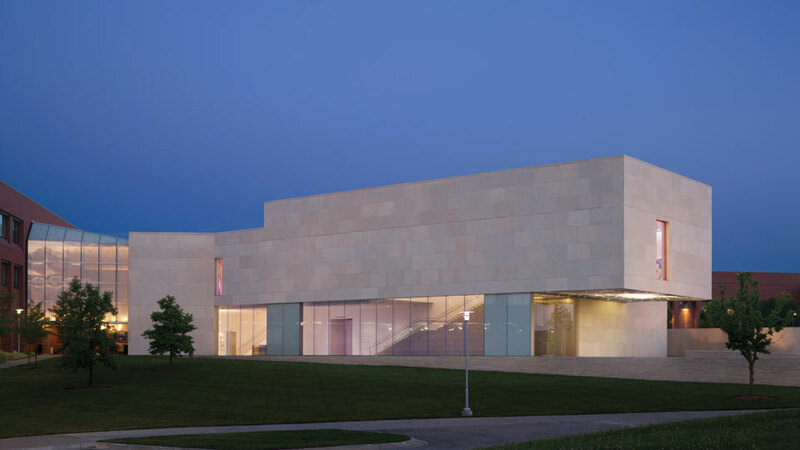 The museum has received national and international acclaim for its architecture, exhibitions, educational programming and collection, including both the JCCC Collection and the Oppenheimer Collection, since opening in fall 2007. With more than 100,000 visitors annually, the museum is regarded as one of the region’s most significant cultural destinations. The Nerman Museum of Contemporary Art is located on the campus of Johnson County Community College in Overland Park, Kansas (a major suburb of metropolitan Kansas City). JCCC is one of the region’s major providers for the visual and performing arts (Carlsen Center). The Nerman Museum of Contemporary Art is an integral part of Johnson County Community College. As such, it is a public institution governed by the college and its publicly elected board of trustees (see Mission). In 2003, Jerry and Margaret Nerman made a pledge (naming opportunity) of $1.5 million to assist in funding the construction of a contemporary art museum on the campus of JCCC. Jerry and Margaret Nerman (along with their son, Lewis) are among the area’s most prominent collectors of contemporary art. Construction of the approximately $15 million Nerman Museum was realized through Johnson County Community College funding with support from the Nerman family, the M.R. and Evelyn Hudson Foundation, the Ewing Marion Kauffman Foundation, Marti and Tony Oppenheimer, Richard I. and Jeanne S. Galamba, Barton P. and Mary D. Cohen, Dean E. Thompson, Irma Starr, Carl and Lee McCaffree, Jim and Mary Tearney, Bruce Hartman, and Joseph and Margery Lichtor. The elegant, minimalist building was designed by architect Kyu Sung Woo and is clad in Kansas limestone. Throughout the museum’s two levels are 11 expansive galleries for temporary exhibitions and the permanent collection. Additionally, the museum houses the 200-seat Hudson Auditorium, Café Tempo, two classrooms, and art storage and preparation spaces. The museum boasts two lobbies – the impressive cantilever entrance (featuring a dazzling 60,000 white LED installation by artist Leo Villareal) and the glass and metal Atrium lobby. The museum’s permanent collection comprises works gifted by Marti and Tony Oppenheimer and the Oppenheimer Brothers Foundation, as well as gifts made possible by the Barton P. and Mary Davidson Cohen Charitable Trust. Art from Johnson County Community College’s permanent collection (acquired largely through JCCC’s annual acquisition fund) supplements the Oppenheimer and Cohen collections on view in the permanent collection galleries.